Welcome Shavuot in the high desert of New Mexico at a Jewish Mindfulness retreat led by Rabbi Yael Levy from May 12 to 17, 2013. Registration for a maximum of 15 participants is now open. Click here to download a brochure. "Standing at Sinai 5773" will be the fifth Jewish Mindfulness retreat that Rabbi Yael, an experienced hiker and backpacker, has led at Ghost Ranch in Abiquiu, New Mexico. "The Mystics teach that at the moment the Torah was received, every soul knew the Oneness that we call God, with no doubt, no hesitation, no holding back," she says. "On Shavuot, we remember this encounter and open ourselves to receive the wisdom and insight that is waiting to be revealed." 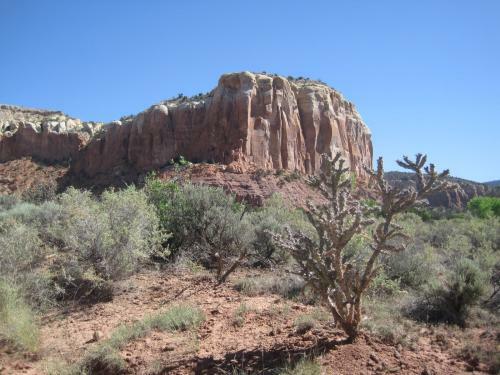 In the five-day retreat, participants will hike through red rock canyons and sit by desert streams. They will count the final two days of the Omer together and prepare for Shavuot with meditation and prayer. On Shavuot, participants will spend the evening in meditation, song and prayer and will greet the dawn together, giving thanks, offering praise and listening to the Ten Utterances being chanted into the rising sun. Each day of the retreat will be centered around Jewish Mindfulness practice, which includes meditation, hiking, singing and “body prayer” as well as periods of silence and “sacred conversation.” There also will be opportunities for questions and study in hevruta and with the group. It is important for participants to have prior mindfulness experience. Hiking is easy to moderate level. (There will be opportunities for small groups to hike more rigorous trails.) Participants will be asked to maintain substantial periods of silence each day.